After graduation from high school, you will face some very important decisions. These might well influence your future course of life very strongly. Probably the most critical of these is the question of what to study. Till graduation, your daily routine was clearly determined by everyday school life. As graduation draws nearer, the question of what to do afterward becomes more pressing. Probably for the first time in your life, it is up to you to take the responsibility of mapping out your journey through life. Provided that you have decided to study at a university (Universität) or a university of applied sciences (Fachhochschule), you have to find a suitable study program. In Germany, more than 100 universities and 200 universities of applied sciences confront freshmen with the agony of choice from more than 10,000 different degree programs. For many people, choosing their study program is one of the most interesting and exciting decisions in their life. However, other people are rather tormented by this decision. The feeling of making a decisive and irreversible mistake in selecting the wrong study program is widespread. The enormous range and variety of study programs does not make the situation any easier. We don’t want you to be tormented by the search for a suitable study. That is why we have compiled the most valuable tips for you to identify the most appropriate program. DOES THE “RIGHT” STUDY PROGRAM EVEN EXIST? That’s the basic question that has to be answered. In the vast majority of cases, the answer is a straightforward “no.” There is no such thing as the “right” study program. However, there are people who already have a firm career aspiration, a pronounced interest, or a special talent in their early years. These types of people will generally find it easier to decide on a certain study program than others. Those of you who wish to become lawyers or state prosecutors should, of course, study law. Anyone who is fascinated by construction sites from their childhood onward is well advised to take up a study of architecture or civil engineering. And if someone is blessed with a talent for drawing, he/she should definitely consider studying art. If you are a person with many interests and strengths in various areas, you probably will be drawn to several degree programs in different academic fields. That does not make the right pick any easier. In order to facilitate your choice of a study program a little bit, hereinafter we want give you some guidance for your decision. This may sound like a no-brainer to you, but things are not as simple as they may seem. In particular, we want to emphasize the word “really.” Given that most study programs last for three to five years, having a genuine interest in the subject matter of the program is a crucial prerequisite. Many high school graduates have no idea of what to expect in a particular study program. In the natural sciences, in particular, the gap between expectation and reality can be vast. For instance, the study of mathematics is known for its intensive preoccupation with theoretical principles, which have little or nothing in common with math instruction at high school. In this respect, opting for a math degree program just because you were interested in math at school might turn out to be a grave mistake. It goes without saying that we do not want to discourage you from taking up any particular study program. We just want to point out that it is very important for you to answer two questions: First, what academic field do you want to engage in the upcoming years? And second, in what business/industry do you want to work after your university? Your personal interests should always be the foundation for the answer to those two questions and, ultimately, your choice of study. Next, you should consider the areas in which you see your individual strengths. School subjects offer a good orientation in that respect. However, your strengths may also lie in areas that were not part of any subject at school. Maybe you have a great talent in composing music. Or you may be good in taking care of animals. Or possibly you are an undetected computer genius. It’s always a good idea to compile yourself a list with all your strengths and to contemplate the areas of life in which these strengths may be best applied. That might help you find an appropriate study program. 3. What does your plan for life look like? This rather difficult question affects your choice of study as well. But who can tell where to direct his/her life at the age of 18 or 19? We want to give you an extreme example as to why it is so important to reflect on this question that can have significant repercussions on your future career and life. Let’s assume you are a talented actor and you just love performing on stage. Let’s also assume that you are a person who dislikes job insecurity and who rather wants to work in a secure position. It is quite obvious that these two assumptions pose a major conflict of goals. Working as an actor in most cases implies being hired on a freelance basis, without the benefits of a permanent position. So, given that acting inevitably entails inherent job insecurity, you should carefully consider whether studying performing arts or dramatics is the right choice for you. But don’t despair. In such a case, it may be advisable to think about a second degree. That would give you the opportunity to expand your decision-making scope on your future career. By holding a second degree, you do not restrict yourself to one type of job or business (e.g. acting), but also keep the doors open to other areas. When deciding on your future study program, you should also take into account some practical aspects linked to it. This issue is closely related to Item No. 3. For example, if you are a person who attaches a great deal of importance to having money and living a luxurious life, then you should consider degree programs that increase your chances of getting a well-paid job. Generally speaking, graduates from engineering, natural sciences and business programs can expect higher salaries than graduates with a degree in humanities. This is, of course, a rough generalization; nevertheless, you should keep the monetary aspect in mind. Another practical aspect as regards your study selection is the question of where to study. In this context, you first have to find out which colleges/universities offer your study program. The worst-case scenario would be that you are forced to move to a city where you don’t like to live at all. We are not saying that your place of study should be the number one criterion for your choice of study program. However, given that you will spend a few years in this place, it is quite important that you feel at home there. And last but not the least, tuition fees are a very central aspect impacting your choice of study and college/university. In particular, if you have decided to enroll at a private academic institution, you should carefully consider the total cost of studying there. Of course, you have the opportunity to apply for a scholarship and/or take out a student loan. But be aware of the financial consequences in paying off that loan in the first few years of your career. No one can give you more valuable advice about a particular study program than those people who know the most about it. These are, of course, members of the college and university staff. Nowadays, almost all academic institutions in Germany (and abroad as well) have designated study guidance and counseling centers, where you can get the answers to all your questions regarding a particular program. 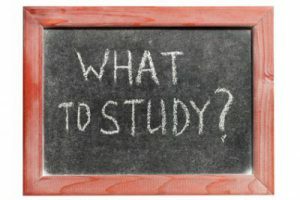 If you are unsure about a certain study program and you require some extra information, it makes a lot of sense to take advantage of study guidance. Also, in case you have already decided on a study program, but not yet on a specific college/university, we would advise you to contact the study guidance centers at the locations of your choice. No study program is the same at each college/university—and differences between them might be significant. Check the details in order to choose the most suitable place to study. Another good way to inform yourself about colleges/universities and their range of studies are so-called “Hochschulinformationstage” (“campus information days”). They will give you a comprehensive picture of campus life at a particular location. And most importantly, you have the opportunity to get in touch with university staff to address all the questions that may come up. In addition, in many cities, you can attend so-called education fairs, where many colleges and universities participate. This is an excellent opportunity to gather information on different study programs and to directly talk to university staff. We do hope that our practical tips will make it easier for you to find and decide on the right study program. Be guided by your interests, strengths, aims in life, and certain practical aspects. To conclude our article, we want to highlight the following message: Don’t be afraid of taking on a certain study program even if you are not quite sure as to whether it is the right one for you. Only very few people really know what to expect at college or university. Maybe you will be enthusiastic about your studies. But, your study program may very well turn out to be a complete disappointment. If the latter, don’t worry—this is not the end of the world. For one thing, you can always switch to another degree program. And for another, you should keep in mind that these days, the choice of study and future career options are not that closely linked, as they used to be in the past. At present, only very few professions require a particular academic degree. So, if you don’t want to become a doctor (and have to study medicine) or a pharmacist (pharmacy), you have a high degree of freedom in choosing your study program. Seize that freedom of choice! This entry was posted in Studies and tagged studies, study, study program. Bookmark the permalink.